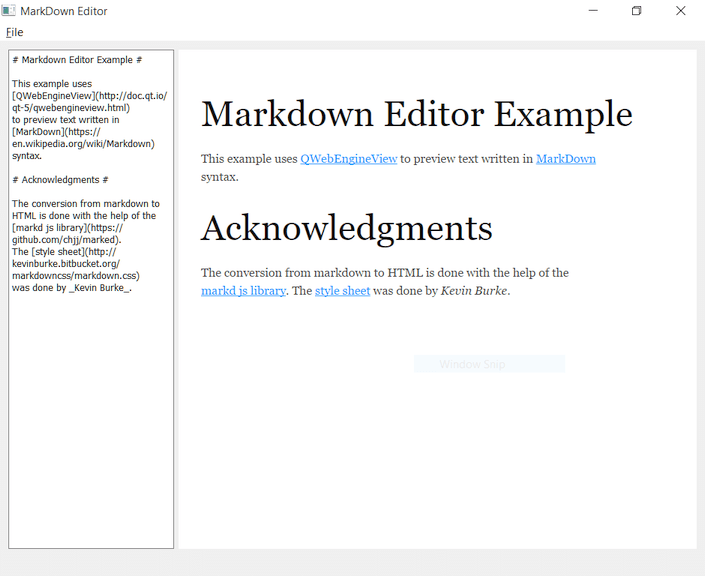 Markdown is a lightweight markup language with a plain text formatting syntax. Some services, such as github, acknowledge the format, and render the content as rich text when viewed in a browser. The Document class wraps a QString to be set on the C++ side with the setText() method and exposes it at runtime as a text property with a textChanged signal. The class declares private slots that match the actions in the menu, as well as the isModified() helper method. The actual layout of the main window is specified in a .ui file. The widgets and actions are available at runtime in the ui member variable. m_filePath holds the file path to the currently loaded document. m_content is an instance of the Document class. The constructor first calls setupUi to construct the widgets and menu actions according to the UI file. The text editor font is set to one with a fixed character width. It then makes sure our custom PreviewPage is used by the QWebEngineView instance in ui->preview. Here the textChanged signal of the editor is connected to a lambda that updates the text in m_content. This object is then exposed to the JS side by QWebChannel under the name content. Now we can actually load the index.html file from the resources. For more information about the file, see Creating an Index File. The menu items are connected to the mapping member slots. The Save item is activated or deactivated depending on whether the user has edited the content. Finally, we load a default document default.md from the resources. Finally, we set up the web channel to access the content proxy object and make sure that updateText() is called whenever content.text changes.